St Elizabeth’s Fete is on today! 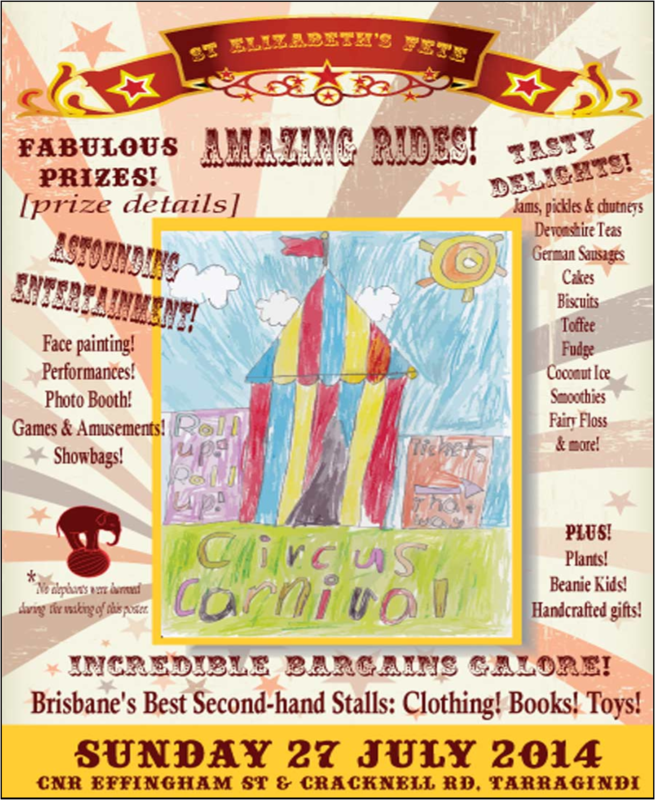 The fete for Saint Elizabeth’s School, Tarragindi, is on TODAY – Sunday 27th July 2014, 10:00am to 3:00pm. Roll Up! Roll Up! The St Elizabeth’s Catholic Primary School warmly invites you for this year’s annual school fete. The children, parents and teachers have been working hard to ensure that the fete is a great success. St Elizabeth’s second hand book stall is well known for its great quality at bargain prices and this year will be no exception. Quality bargains will also be found in the second hand clothes stall. There will be a wide range of delicious home-baked goods on offer at our exceptional cake stall. The gift and craft stall will again feature a range of unique homemade crafts and well-priced direct factory-sourced merchandise. Come and enjoy the delicious food, refreshing drinks, awesome rides, Devonshire tea and wonderful community atmosphere. Plenty of child-friendly entertainment with a “Circus” theme should ensure a great day out for the whole family. The fete is on Sunday 27th July 10am-3pm. 55 Effingham St, Tarragindi.